If you will remember, I abolished Vacations last year. For some reason, my Staff have chosen to ignore me on this point. My Assistant Boss has left for somewhere with sunshine, and my staff has worked Very Hard to ensure my happiness in her absence. I was presented with a wonderful ball of compressed Catnip! You can see I have mastered the Art of Holding It Still with my right paw. This keeps me from having to chase it around. For some reason my AABs were a little put out by my mastery. I have also received countless tummy rubs, treats, snuggles, and Cathie and Bonnie have come to visit me on Sunday, when the library is Closed. I may take it easy on Assistant Boss Karen when she returns. . . but we'll see how the rest of the week goes. I do not know who ordered this or WHY they think it is appropriate for My Library. I have heard it is someone in the Youth Department, so I will have to have a talk with them. Mouses should not be in a Library! What if they get hungry and try to eat a book? What if a mouse scares someone, and the person runs screaming into AB Karen's office (assuming she isn't on Vacation, of course), and I jump onto my desk in surprise and knock my water cup over on Very Important Library Documents? Because I am a good Library Cat, I will not demand that this book be sent back immediately. Someone could think that this is a Very Good Book, especially for our little customers who are learning to read. I realize that there may be wrong different opinions, and a good Library Cat realizes that all of these opinions should be represented. But still. . . I am Thankful for Apples. . .
. . . and my strong and sharp teeths. I am not impressed with teeny-tiny Carrots, though. It's time for my Big Huge Gigantic Super-News! Cat Fancy Magazine featured 45 Amazing Library Cats in the February 2010 issue. 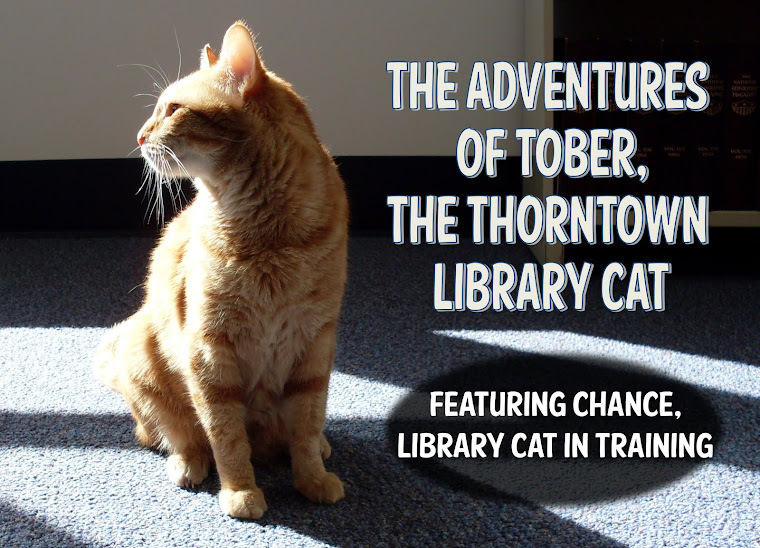 Now, everyone should know that a list of Amazing Library Cats wouldn't be complete without me. I was not #2. . . or #3. . . or #4. 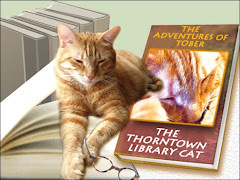 By the time I turned the page, my tail was beginning to droop and my purr was weakening. Still, Amazing Library Cat that I know I am, I read on. I was not #10 or #20. 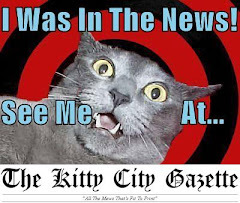 I was forming a letter to the Editor of Cat Fancy Magazine (who I thought should probably change careers) in my head. But my reading paid off! I am #42 on Cat Fancy's list of Amazing Library Cats! I am famous! I didn't even have to TRY to get on the list. . . they came to me! It was a wonderful (and well deserved) surprise! Just so no one gets overly excited, please note the paperclip on my photo. It is there for a reason. No offense to that other cat, but people need to know who's who around here. 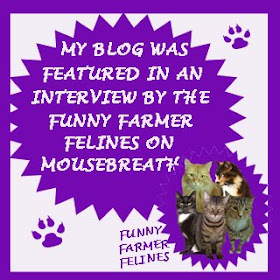 First of all, a Terrible Awful Horrible Thing happened to my blog around Christmastime. I was looking at my blog posts one night (and marvelling at my brilliance) when I noticed that one of my older posts had 75 comments. At first I was really excited, but AAB Christine said "uh-oh Tober" and read the comments. I've had to turn on Comment Moderation for my blog, so now I get to see what you say before the rest of the world sees it. It kind of makes me sad, because I like it when I make a comment and I get to watch it magically appear! I imagine my Blogging Friends like that, too. If you will notice, I am quite relaxed at this point. My right paw is almost entirely Starfish-ed and my left paw is preparing to make a Starfish when the right paw is done. AAB managed to get nicely between each shapely toe to help me relax. Does anyone else get paw massages? I highly recommend them to Everycat! Here is another picture. This picture was taken shortly after Christmas. Assistant Assistant Boss Britta was removing the Christmas-y things from the window of the Young Adult Room and I thought that this piece of fabric would make a nice backdrop for my stunning Furs. Of course, I was right. I have Big Huge Gigantic Super-News to post later this week. I will try to encourage Assistant Assistant Boss Slowpoke (name changed to protect her identity) to help me post tomorrow! Actually. . . . you may already know!